LANSING (OCT. 31, 2018) — Michigan’s largest political actions committees, or PACs as they’re commonly known, are collecting a record-breaking amount of money ahead of the 2018 election. According to new campaign finance disclosures, Michigan’s largest 150 PACs combined to raise $80 million from Jan. 1, 2017, through Oct. 20, 2018. The past fundraising record by the top 150 PACs for an entire two-year election cycle came in 2014 when they raised just $68 million from Jan. 1, 2013, through Dec. 31, 2014. The 2018 total is already 17 percent above the 2014 record with more than two months before the end of the year. As of Oct. 20, 2014, the top 150 PACs had raised $60 million in the 2013-2014 cycle. PACs, which are usually connected to interest groups, political causes or public officeholders, raise money to support candidates or to directly influence voters through advertisements or other campaign efforts. 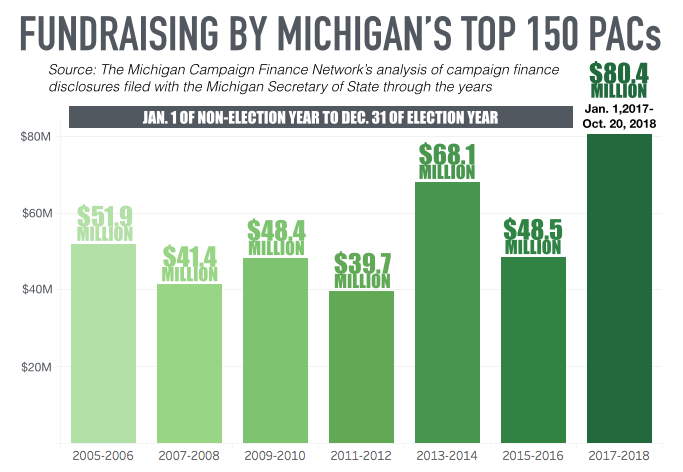 The fact that they’ve raised a record amount of money for 2017-2018 is another sign that Michigan’s 2018 election will be one of the most expensive in state history. It’s an election in which Michigan voters will reset state government. On Nov. 6, they will choose a new governor, a new secretary of state and a new attorney general. They’ll also fill two seats on the Michigan Supreme Court and every seat in the state Legislature. 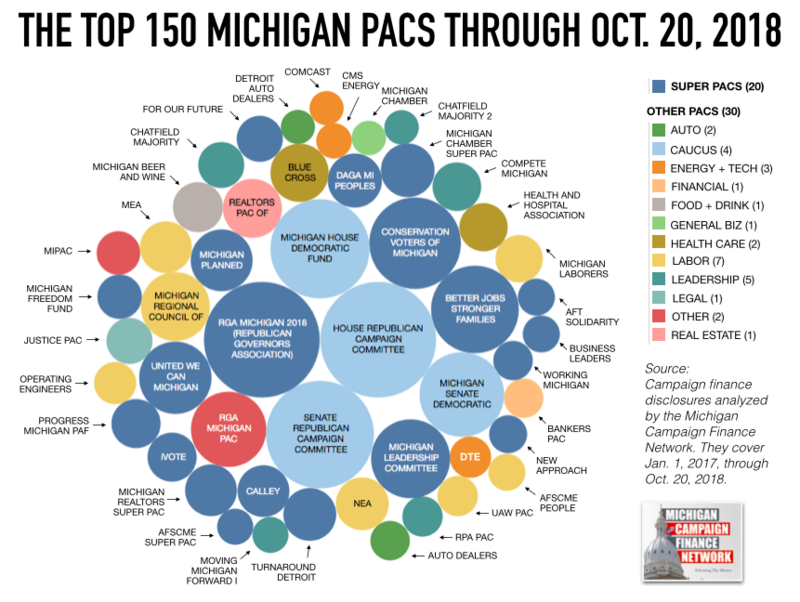 The high stakes in Michigan have inspired interest groups to pump more money into their PACs. But there are other trends at play as well. One of them is the growing role of super PACs. These are PACs that can take money from corporations and spend unlimited amounts to try to influence races as long as they do it without coordinating with candidates. 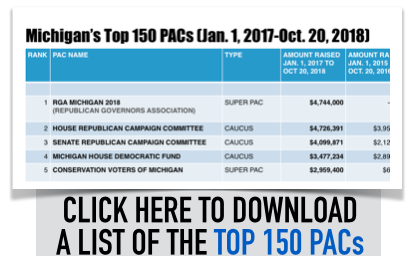 There are 39 super PACs on the new top 150 PAC list. At the same point before the 2014 election, there were only 32 super PACs on the list. On top of that trend, leadership PACs — these are PACs that public officeholders use to raise money to give to like-minded candidates — are raising record amounts of money. For the 2013-2014 election cycle, only one leadership PAC raised more than $400,000. That was Sen. Arlan Meekhof’s Moving Michigan Forward Fund, which raised $530,093 from Jan. 1, 2013, through Dec. 31, 2014. This cycle, six leadership PACs have already raised more than $400,000. The four caucus committees have also seen a large bump in funding. They raise money on behalf of the House Democrats, House Republicans, Senate Democrats and Senate Republicans. They’ve raised $14.8 million since the start of 2017. Their previous record fundraising total at this point before an election was $10.8 million in 2006. MCFN published a report on where the caucus committees’ money is coming from on Oct. 26. Of the top 20 PACs in fundraising so far, 11 are super PACs. The most active super PACs have been focused on the race for governor between Attorney General Bill Schuette, a Republican from Midland, and former Senate Minority Leader Gretchen Whitmer, a Democrat from East Lansing. The top super PAC has been RGA Michigan 2018, which the Republican Governors Association is using to try to help Schuette. The PAC has reported raising $4.7 million and spending $4.3 million on advertisements in opposition to Whitmer. The PAC’s top donors include Pfizer Inc., which gave $250,000, Wal-Mart Stores Inc, which gave $200,000, and Karen B. Wright, of the Ariel Corporation, who gave $189,999. Another pro-Schuette super PAC, Better Jobs, Stronger Families, has raised $2.7 million. It supported Schuette in the primary election. Its top donors include Roger Penske and the Penske Corporation, which gave $385,000, and the nonprofit Fund for Michigan’s Tomorrows, which gave $300,000. Whitmer is also seeing support from super PACs. The Conservation Voters of Michigan has raised $2.9 million and has spent $1.9 million in support of the Democratic nominee. The group’s top donor has been the League of Conservation Voters, a national environmental nonprofit based in Washington, D.C.
United We Can, a super PAC connected to the Service Employees International Union, and Michigan Planned Parenthood Votes have also spent heavily in support of Whitmer. They’ve raised $1.8 million and $1.3 million respectively. Super PACs aren’t limited to the race for governor. The IVote Michigan Fund has been supporting Democrat Jocelyn Benson for secretary of state. That super PAC has raised $876,351, according to its disclosure. The individual leadership PAC that has raised the most money since the start of 2017 belongs to state Sen. Mike Shirkey, a Republican from Clarklake, Shirkey is expected to be the next Senate majority leader if Republicans keep control of the Senate. His PAC, Compete Michigan, has raised $837,120. Its top donors include Nancy and John Kennedy, of Autocam, who gave $120,000, members of the DeVos family, who gave $50,000, and William Young, CEO of Plastipak Packaging, who gave $50,000. Unlike Shirkey, Rep. Lee Chatfield, a Republican from Levering, has two leadership PACs that have been bringing in big bucks. Chatfield is expected to be the next House speaker if Republicans keep control of the House. The Chatfield Majority Fund has raised $768,975 while the Chatfield Majority Fund 2 has raised $420,630. The Chatfield Majority Fund has received $60,000 from the Republican State Leadership Committee and $50,000 from members of the DeVos family. Chatfield Majority Fund 2 has received $70,000 from the Republican State Leadership Committee, $50,000 from Ron Weiser, chairman of the Michigan Republican Party, and $50,000 from Anthony Soave, CEO of Soave Enterprises. The top individual leadership PAC connected to a Democratic state lawmaker is The Elder Fund for Michigan of Rep. Brian Elder, a Democrat from Bay City. The PAC has raised $247,275 with $200,000 coming from the United Auto Workers’ Michigan PAC. Detroit Mayor Mike Duggan’s Duggan Leadership Fund has raised $288,582. It’s received $15,000 from the J.P. Morgan Chase & Co. PAC, $15,000 from Linda Nelson, CEO of Nelson Ventures, and $12,000 from the Blue Cross Blue Shield of Michigan PAC. Senate Majority Leader Arlan Meekhof’s Moving Michigan Forward Fund I and Moving Michigan Forward Fund II have raised $465,158 and $400,495 respectively. The Stamas Leadership Fund of Sen. Jim Stamas has raised $275,637. And House Speaker Tom Leonard’s Michigan Values Leadership Fund has raised $267,410. ARTICLE What Are Leadership PACs And Why Are They Becoming Bigger Players In Michigan?